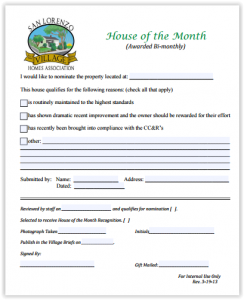 Every other month the Association will be choosing a house from those nominated by you as the House of the Month. To nominate a beautiful, well-maintained home in your neighbor, please complete the attached form and submit it to the SLVHA. © 2019 San Lorenzo Village Homes Association.